The 12th annual congress of the SASVEPM was held in Port Elizabeth between 20 and 22 August 2014. The continuing education speaker was world renowned veterinary epidemiologist Prof Dirk Pfeiffer from the UK. He gave a total of 5 presentations on the topics of: Spatial analysis in Veterinary Epidemiology, Antimicrobial resistance in animals, a systems perspective of avian influenza and then a final talk on animal health decision making in a one health context. The global perspective that he portrayed was very informative and very applicable to to attendees of the congress. 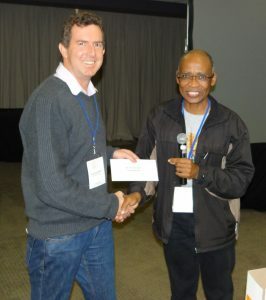 The winner of the best presentation went to Dr Darryn Knobel (below left receiving his prize from Dr Alan Kalake – SASVEPM President) from the University of Pretoria. He presented on the control of rabies in dog populations and discussed vaccination strategies in conjunction with the R0 of the disease. It was very good to see a number of young researchers presenting their work, including some non veterinarians. In particular there was a presentation from Ms. Kemeiloe Malokotsa, a technician from ARC/OVI who is supervised by Dr Evelyn Madoroba. Kemeiloe presented on the “Virulence profiles and antimicrobial resistance patterns of Escherichia coli among diverse animal species in South Africa” Another excellent presentation was by Dr Laura Roberts, a masters student from the University of Pretoria, who presented on a very informative technique called multiple criteria decision analysis. 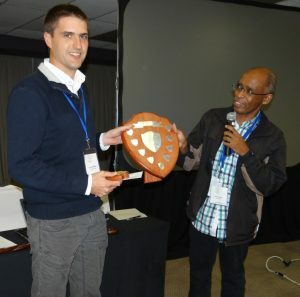 Dr John Grewar (below left) was awarded the annual Willie Ungerer Memorial Epidemiology Prize for 2013/14. The congress was a sell out in terms of numbers and was our biggest congress to date with over 200 registrations. We look forward to continuing with this success when we host the next SASVEPM next year in the Free State province of South Africa.